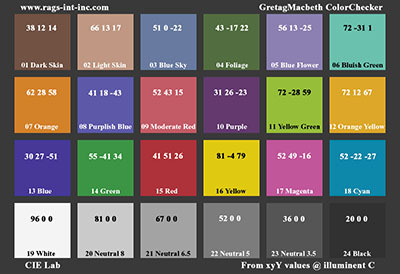 I have seen several different suggestions about what the proper numeric values are for the colors in a Gretag Macbeth twenty-four patch Color Checker. For some strange reason, most of these show some color shifts in the neutral patches. This did not seem right, so I have pursued some research. Gretag Macbeth gives numeric values for the twenty-four patches in CIE xyY encoding, Munsel Notation (Hue Value/Chroma), and RGB. Unfortunately, the RGB color space is never identified. Therefore, none of these values can be input to Photoshop without being transformed to a color space supported by Adobe. The natural choice is the reference color space, CIE Lab of course. While building the spreadsheet I discovered where the suspect color cast was coming from. All the neutral patches had the same “xy” values of .310 and .316. It turns out that these values are neutral for the CIE Illuminant C. More precisely, the values would be 0.310115 and 0.316312. These transform to consistently neutral tones only if you assume Illuminant C. Any other CIE Illuminant results in some color-cast (as might be expected). Since the source Illuminant is a significant factor in the transformation mathematics, a wrong assumption produces incorrect Lab values, even in the colored patches. I could not input these precise values into Photoshop for several reasons. First, even in 16-bit mode Photoshop only allows the user to enter 8-bit values. Second, Photoshop doesn’t really use 16-bit values, it uses a unique version of pseudo 15-bit values. There have been several discussions about this in the Adobe forums and Adobe insists that its bizarre math is sound. Anyone who dares to question this is labeled a heretic. But, if you create a CIE Lab image file in 16-bit mode and try to enter neutral values (a,b = 0,0) you will see them being changed before your very eyes. Convert the image to 8-bit and you will see new and different non-neutral values. You should also be aware that the Adobe calculations for HSB values in the Info menu are based on your default color space rather than the image’s current color space. Thus the HSB values are also very often wrong. For now all I can do is round the spread sheet values to 8-bit numbers to build a reference target image. The result (as a TIF file) can be downloaded from here. Once a set of values in CIE Lab encoding have been established, the corresponding values in any other color space are simply a matter of profile conversion. These daylight target image values should not be used for color calibration under tungsten light. The correct way to obtain target values for other lighting conditions would be with a spectrometer (and a lot of math) or a colorimeter. In other words, the same paper targets but new measurements. And in this case the values obtained should not be represented as applicable to other targets or light sources. As this relates to ACR, you should not need a separate calibration for each light source. The white balance controls should be providing the proper compensation for variations in the light source. There have also been some discussions about the value of the middle neutral tone. This has two significant implications. One is that your light meters are calibrated against a middle tone. The other is that the ACR brightness and contrast sliders are based on the middle tone. Let’s start with the fact that a middle (50%) density tone results from an optically 18% transmitting or reflecting surface. This is also defined as the photographic gray tone that your light meter is calibrated to. In fact, mathematically it works out to 18.5%. In spite of this there are several folks that insist that the reflectance is really 12.5%. And there are some that insist that the reflectance is truly 22%. For the record, spectral reflectance of 22% places the mid-point at L=54 in the CIE Lab encoding. 18.5% results in L=50. 12.5% would result in L=42. GretagMacbeth calls for a “Neutral 5” Y value of 19.8(%) resulting in L=51.6. As carefully as I have been able to measure it, the “Neutral 5” patch consistently gives precisely the same readings as a Kodak 18% gray card. My vote is that the middle value should be Y=18.5 and L=50. Once I find out what the numeric values should really be for the “Neutral 3.5” and “Neutral 6.5” patches it will be possible to technically calibrate a camera image (properly exposed) with the ACR brightness and contrast sliders. You can check my math with the spreadsheet above. You can validate the spreadsheet math against the textbooks below or by using Bruce Lindbloom’s CIE color calculator. I have subsequently created a new Color Calculator script. It is described and available here: ColorCalculator. Again only for those who are obsessively interested in these topics.